Charity Week is a new initiative for the Ramsey Academy, Halstead where each House has the task of raising money in aid of their chosen charity. Aspiration was the first House to host the special Charity Week; Diversity will follow in the Spring term in aid of Essex Air Ambulance and Endeavour in the Summer term in aid of PARC. Students discussed in their form groups which charity they would like to support; overwhelmingly Aspiration students chose ‘The Smile of Arran Trust’, a new charity set up in memory of Arran Tosh, an inspirational 13 year old student from Sudbury who sadly died from a brain tumour. Several students from Ramsey knew Arran through football and music events. Aspiration rose to the challenge magnificently to raise money in support of The Smile of Arran Trust which will help children who are diagnosed with cancer. We had set ourselves a target of £1,000 but would we achieve it? The House Captains, Hannah Page and Elizabeth McKean, not only rallied the form representatives into action, but also rattled buckets all week. The Sports Captains, Billy Carroll and Saffron Hewitt began organising the sporting events. Daily cake sales at morning break showed amazing talents in the kitchen and raised a tasty £225! Year 9 Aspiration students hit £60 alone! The FIFA 2015 tournament almost took the roof off with the noise – students paid to watch people playing on Xbox? Incredible! The basketball and netball matches of Year 11 students against the staff were extremely well-supported – the appearances of certain staff were definitely crowd pleasers, so a big thank you to Mr James, who also donned an oversized Aspiration T-shirt in the name of charity. The concert at Friday lunchtime packed the hall, where students sang, played and danced beautifully, not only to entertain staff and fellow students, but also to raise more funds. Mrs Judith Smith from Humes of Halstead Bakery kindly offered to bake a cake for the occasion – complete with the Aspiration House logo – which was raffled to staff and raised another £80! The delicious cake was won by Ms Gerrard who shared it very generously at our next House meeting. Year 7 and 8 students joined the fun of the disco on Friday night and danced their way to the close of Charity Week, complete with a chocolate raffle and multi-coloured glow sticks. 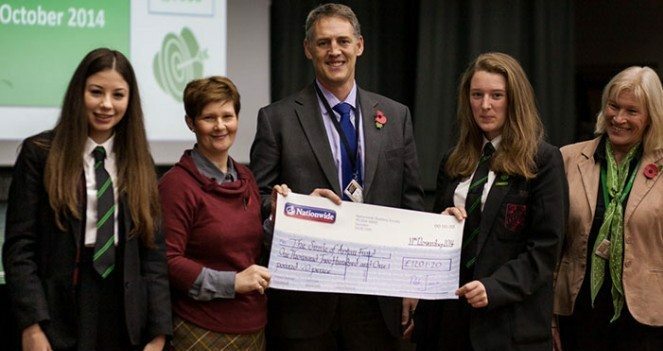 Mrs Alison Tosh bravely joined Aspiration for their assembly to collect a cheque for £1201.20 and to thank the students for their outstanding efforts and generosity. So Aspiration would also like to thank all students, staff and parents for their generous contributions and help throughout a non-stop week, which enabled us to exceed our target.